Micro PCNL (Percutaneous Nephrolithotripsy) or Microperc have been designed to approach internal structures and targeted stone below full visualization of every layers passed by the kidney devoid of the need for tract dilation. Even though it was considered as a minimally invasive method, cost effective and remains the most pioneering technique in use, only some studies on the purpose of the microperc technique has been reported, but the safe use of this procedure even in chronic kidney disease, pediatric cases, ectopic kidneys and bladder calculi has been established. Complications and risks with microperc were lower when compared with other standard PCNL procedure complications. The kidney stone clearance rate reported with microperc ranges from 85% to 93%. Microperc (Micro PCNL) is a method which was done by using a 16-gauge needle. The method was generally performed under general anesthesia. Yet, it can be done under regional anesthesia if required. In Microperc or Micro PCNL, the method was performed by a 4.85-Fr (16 gauges) tract. The fundamental hypothesis of the ‘All-seeing needle’ was that if the initial tract is perfect, then tract-related morbidity will be considerably reduced. The optical needle may helps to get rid of any traversing viscera. Even though another benefit of microperc is that it was a single-step renal access method, which results by a shorter insertion. Therefore, this procedure can provide a original standard of obtaining renal access. 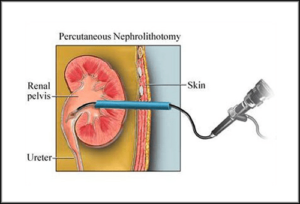 Patients with uncontrolled diabetic nephropathy and diabetes mellitus, chronic renal failure who requires dialysis, patients who are younger than 18 years and patients who are suffering with a disease called rapid cell turn-over (like lymphoma, leukemia, etc..) are not recommended to undergo this micro PCNL operation. But micro PCNL are having very low percentage of complication and risk rate, and associated with minimum risk of ureteric trauma and less need for extended post-operative ureteric stenting.